My personal mailbox, with emails going back to the late 90's, is full of old attachments that bloat the PST file, but aren't really needed. The PST file, with attachments, is around 40Gb now. I decided to write a simple C# console app to extract them to reduce the size of my PST file. Using the function below, we initially pass it the current folder. 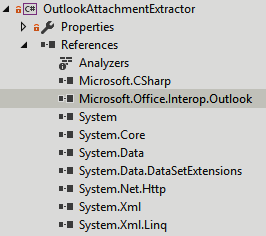 It will then iterate through the folder.Items object, which literally contains a collection of the actual email messages in the outlook folder. Each email is a returned as an item, containing the property .Attachments.Count, which indicates how many attachments the email message has. Where this is not zero (!= 0), we simply list out each attachment in the email. From here you can save the attachment, delete it, or otherwise process it however you wish. It's quite common for Outlook to store embedded images (such as logos in an email) and other files you wouldn't normally need as attachments, so I create an array of extension types that I'd like to extract, ignoring those that aren't useful to me. By comparing the attachment filename to the array of extensions, I can then determine what to keep. As this is only performing a basic string comparison, any file containing one of the strings in the array will be identified. For example both hellowworld.doc (Office) and hellowworld.docx (Office Open XML format from Outlook 2007 onwards) contain .doc so will both be identified. Similarly, deleting attachments is as simple as invoking the .Delete function.